The TCU Horned Frogs football team is the intercollegiate football team of Texas Christian University (TCU). The Horned Frogs compete in Division I Football Bowl Subdivision (FBS), the highest level of intercollegiate athletics sanctioned by the National Collegiate Athletic Association (NCAA) in the United States. Since 2012, the Horned Frogs have been a member of the Big 12 Conference, and were previously members of the Mountain West Conference (MWC), Western Athletic Conference (WAC), Conference USA (C-USA), Southwest Conference (SWC), and Texas Intercollegiate Athletic Association (TIAA). TCU began playing football in 1896 and claims national championships in 1935 and 1938. TCU has one Heisman Trophy winner, Davey O'Brien, and has had eight former players inducted into the College Football Hall of Fame. The Horned Frogs play their home games in Amon G. Carter Stadium, which is located on the TCU campus in Fort Worth. TCU ranks as the 28th best college football program of all time and the 4th best private college football school of all time. (Private schools#1Notre Dame, #2USC, #3Miami, #4TCU) http://collegefootballnews.com/2016/ap-college-football-rankings-greatest-programs-of-all-time. Prior to joining the Southwest Conference in 1923, TCU amassed a record of 165–15–0. In 1912, TCU went 8–1–0 and scored 230 points while only allowing 53 points the whole season. In 1920, TCU won its first conference title as a member of the Texas Intercollegiate Athletic Association (TIAA). The Horned Frogs' 9–1–0 record earned them a spot in the Fort Worth Classic, also known as the Dixie Bowl, against Centre College. Although the game was played in Fort Worth, Centre won the game 63–7. In 1923, TCU endured a 5-game winning streak during its first year in the SWC, but it earned a 2–1–0 conference record and a 5–4–0 overall record. One loss that year was a 40–21 decision against TCU's emerging rival, the SMU Mustangs, who went 9–0 en route to a conference championship. The next year, TCU finished second place in the conference with a 5–1 SWC record and another 5–2 overall record. After two great seasons, the Horned Frogs righted the ship. Prior to 1923 TCU had had a revolving door of coaches, with no coaching the football for more than two years. Following entrance to the SWC, the school established a high degree of stability, employing just four coaches over the next 43 years, and would not hit last place again until 1953. Under those four coaches (Bell, Schmidt, Meyer, and Martin, the Frogs accumulated a record of 262–165–30. Matty Bell, who began coaching the Frogs in 1923, had his best year in 1928, his last year as coach. That year's only losses came at home 7–6 to the Baylor Bears and to Texas by a score of 6–0. That year the Frogs finished in second place in the conference at 8–2–0 overall and 3–2 in conference play. The 1929 season saw the arrival of Coach Francis Schmidt and TCU's first SWC title. The title was won in the last game of the year on November 30, 1929 against SMU. Coming into the game TCU led SMU in the conference standings. TCU had 4 wins, while SMU's conference record was 3–0–1. Since this was the last conference game of the year for both teams, TCU could win its first SWC title with a win or a tie. The first half of the game was scoreless, but in the third quarter Weldon "Speedy" Mason tacked on 40 yards to a 16-yard pass from SMU quarterback Bob Gilbert. After the extra point, the Mustangs led 7–0. TCU would not score until its second time on the SMU] 1-yard line in the fourth quarter. That is when TCU quarterback Howard Grubbs ran behind All-SWC fullback Harlos Green and Mike Brumbelow for the game-tying score. The Frogs left plenty of time on the clock for SMU to answer their score, but Grubbs, now playing defense, intercepted Gilbert's pass. TCU then ran the clock out to force the tie and to win its first SWC title. In a TCU Stadium that seated 30,000 spectators, over 36,000 wildly excited Texans and visitors from every corner of the map packed, jammed, and fought their way into every square foot of standing and seating space to see one of the greatest football games ever played…this tense, keyed up crowd even leaped the wire fences from the top of automobiles…"
SMU scored the first 14 points of the game. TCU, led by All-American quarterback Sammy Baugh, tied the game at the beginning of the fourth quarter. Then, with seven minutes left in the game SMU, on a 4th and 4 on the Frogs' 37 yard-line, lined up to punt. Quarterback Bob Finley threw a 50-yard pass to running back Bobby Wilson who made what is described as a "jumping, twisting catch that swept him over the line for the touchdown." TCU would lose the game 20–14, but would be invited to play the LSU Tigers in the 1936 Sugar Bowl, where the Frogs would be victorious 3–2 at messy and muddy Tulane Stadium. Meyer led TCU to a win in the inaugural Cotton Bowl Classic in 1937. A year later, TCU would go undefeated in 1938 behind TCU's only Heisman Trophy winner—quarterback Davey O'Brien. That year the Frogs' closest game came against the University of Arkansas where they beat the Razorbacks 21–14 in Fort Worth. They were invited to the 1939 Sugar Bowl and beat the Carnegie Tech Tartans from Pittsburgh by a score of 15–7 in front of more than 50,000 spectators. Meyer coached TCU from 1934 to 1952, compiling a record of 109–79–13. He also won seven Southwest Conference titles. During Meyer's tenure, TCU played in the first nationally televised regular season game against Kansas. When Dutch Meyer retired, his backfield assistant, Abe Martin, became head coach at TCU. One of his three tries at a SWC title came in 1958. The Frogs only losses were to Iowa by a score of 0–17 and at #18 SMU, 13–20. The 1958 season ended in a scoreless tie against the Air Force Falcons in the 1959 Cotton Bowl Classic. Martin-led TCU teams amassed a 1–3–1 record in bowl games. The lone win came in the 1957 Cotton Bowl Classic against a Jim Brown-led Syracuse team in front of 68,000 spectators. A blocked extra-point attempt was the difference in the game and allowed the Horned Frogs to win 28–27. After TCU won the 1959 SWC championship, the Horned Frogs did not earn another share of the conference title for twenty years. During this time, TCU played the role of the underdog. In 1961, Bill Van Fleet of the Fort Worth Star-Telegram called the Horned Frogs' 6–0 win at then-No. 1 Texas, "the season's greatest upset of the year." In 1965, TCU traveled to El Paso to play in the Sun Bowl against UTEP; the Frogs lost 13–12. After Abe Martin's coaching retirement, the state of football at TCU declined in the late 1960s and into the 1970s. Coaches Fred Taylor, Jim Pittman, and Billy Tohill showed limited success from 1967 until 1973. Pittman had a .500 (3–3–1) record in his lone season when he succumbed to a sideline heart attack at Baylor in game eight of 1971. Under Coach Jim Shofner ('74–'76) the Frogs struggled mightily to a 2–31 record that included a winless 1976 campaign. F.A. Dry's coaching administration commenced in 1977 and reveled in a 2–9 record after the previous poor seasons. In his six seasons, Dry's Frog teams mustered only 12 wins total and no seasons with more than 3 wins. TCU would have a successful year in 1984 under coach Jim Wacker. That year TCU leaned on All-American running back Kenneth Davis. The squad started the season 8–0 finishing the regular season with three losses. The Frogs got invited to the Bluebonnet Bowl in Houston that year to play the West Virginia Mountaineers. The Frogs would lose against the Mountaineers 31–14 and finish with a record of 8–4. TCU wouldn't attend another bowl game until the 1994 Independence Bowl. In 1986, the NCAA placed TCU on three-year probation. They found that 6 boosters provided football recruits and football players with cash and other forms of payment. The final penalty of the NCAA was to ban TCU from post-season play for one season, a forfeiture of TV revenue for the 1983 and 1984 seasons, only 10 scholarships for the 1987–88 academic year and only 15 scholarships for the 1988–89 season. The NCAA said it would have given TCU a harsher penalty: a three-year ban from postseason play, a three-year television appearance ban and no new scholarships for two years. In the NCAA's public release they imposed a reduced penalty because TCU self-reported the violations, suspended the players in question, fully cooperated with the enforcement committee and presented a lack of previous infractions. In 1992, TCU hired Pat Sullivan, the 1971 Heisman Trophy winner from Auburn, as head coach. His tenure at TCU was plagued with inconsistency, but marked the beginning of the new TCU renaissance. In 1992, his first year as head coach, Sullivan introduced a new arched TCU logo. This change to the uniforms was part of a broader plan by Sullivan and the school to replace the expectation of losing with a new look and attitude, including returning to a natural grass playing field. Since its introduction the arched TCU has become the preferred and most popular of the school's logos. In 1992 Sullivan's team finished 2–8–1, but one of their victories was a 28–14 triumph over the Texas Longhorns, which was a major accomplishment for the program at that time. The 1993 team continued to show signs of improvement, finishing 4–7. 1994 was Sullivan's best year. In the final game of that season, Sullivan led TCU to a 24–17 victory over Texas Tech before a crowd of 43,000 at Amon Carter Stadium. That victory propelled the Frogs to a 7–5 record and a share of the Southwest Conference title. It was the first Southwest Conference title for TCU since 1959. Invited to the Independence Bowl in Shreveport, Louisiana the Frogs lost, 20–10, to the Virginia Cavaliers. After 1994, the team regressed: the Frogs went 6–5 in 1995, the last year of the Southwest Conference. TCU struggled even more during Sullivan's final two seasons, when the team competed in the Western Athletic Conference. They finished 4–7 in 1996, and a disastrous 1–10 campaign in 1997 led to Sullivan's mid-season resignation. 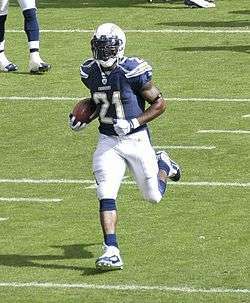 One of Coach Sullivan's greatest contributions to TCU was the recruitment of future NFL star running back LaDainian Tomlinson to Fort Worth. Under Dennis Franchione, and with the stellar play of backs Tomlinson and Basil Mitchell, a 6–5 TCU defeated the USC Trojans in the 1998 Sun Bowl. The high point of the Franchione era was a 10–1 regular season record, a Mobile Alabama Bowl berth vs. Southern Miss and a season-ending #13 AP national ranking in 2000. In the three years Coach Franchione coached TCU, his bowl record was 2–0 and he accumulated three WAC Championships. Franchione coached the entire 2000 regular season, but left for the head coaching position at the University of Alabama prior to the 2000 Mobile Alabama Bowl. Defensive Coordinator Gary Patterson took over as head coach for the bowl game in 2000, a 28–21 loss to Southern Miss. In 2001 TCU left the WAC for Conference USA (C-USA). TCU would stay in C-USA for only four years before accepting an invitation to join the newly formed Mountain West Conference (MWC). Patterson led the Horned Frogs to six conference championships. In 2002, TCU shared the C-USA title with Cincinnati. In 2005, TCU won the MWC title their first year in the league, and the Frogs claimed additional conference crowns in 2009, 2010, and 2011, and Patterson's first conference championship in a "Power 5" conference, the Big 12, sharing the conference crown with rival Baylor in 2014. Patterson has had a winning season every year except 2004 and 2013, and TCU has gone to a bowl game every year except 2004 and 2013. In the 2005 Houston Bowl, played at Reliant Stadium in Houston, Texas, the Horned Frogs defeated the Iowa State Cyclones by a score of 27–24. In the 2006 Poinsettia Bowl TCU defeated the Northern Illinois Huskies 37–7. In 2007, the Horned Frogs returned to play in the 2007 Texas Bowl, a revival of the old Houston Bowl, and defeated the Houston Cougars, 20–13. In a return to the Poinsettia Bowl in 2008, the #11 Frogs defeated unbeaten #9 Boise State 17–16. Boise State was the second-to-last unbeaten team in the nation in 2008 besides the Utah Utes. TCU's Poinsettia Bowl victory helped them finish the 2008 season ranked #7 in the country. In 2009, TCU again attained national prominence with its second undefeated regular season (12–0) and first since Dutch Meyer led the Frogs to perfection in 1938. 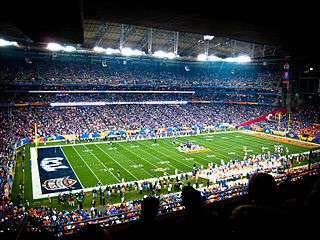 They lost in the 2010 Tostitos Fiesta Bowl 17–10 to the Boise State Broncos, on January 4, 2010—their first major-bowl appearance since the 1959 Cotton Bowl. In the following year, the Horned Frogs capped their second consecutive perfect regular season with a win in their first Rose Bowl, a 21–19 victory over Big Ten co-champion Wisconsin on New Year's Day, 2011. This capped off only the second undefeated and untied season in school history. After going 11–2 and winning the Mountain West title again in 2011, the Horned Frogs played Louisiana Tech in the Poinsettia Bowl. TCU won 31–24 in a somewhat lackluster performance after narrowly (and somewhat controversially) missing their third BCS Bowl bid in a row. TCU finished 16th in the final BCS rankings, two slots below the cutoff for a non-AQ team to get a BCS bid. The win allowed Patterson to tie Meyer as the winningest coach in TCU history. On October 10, 2011, the TCU Board of Trustees approved an invitation to join the Big 12 Conference, and entered that conference on July 1, 2012. The move to the Big 12 was a return "home" in a sense for the Horned Frogs, as they renewed many of their in-state rivalries from the old Southwest Conference. Before the move to the Big 12, the Horned Frogs had been reckoned as one of the closest things to a major football power in a mid-major conference. Amon G. Carter Stadium, the Horned Frogs' home field since 1929, concluded large renovations prior to the 2012 season. It featured a new press box, suites, club seats and improved fan amenities in many areas — new and more comfortable seating, wider concourses, new and improved restrooms and concessions areas, handicapped-accessible accommodations, elevators and escalators to move patrons among levels, and new lighting. The stadium was used during the 2011 season while being renovated. The Horned Frogs played their first game in the renovated stadium on September 8, 2012, and routed Grambling 56–0. The win was also Patterson's 110th win with the Horned Frogs, making him the winningest coach in TCU history. TCU would finish their first regular season in the Big 12 at 7–5 before losing to Michigan State in the Buffalo Wild Wings Bowl 17–16. The Horned Frogs returned to national prominence in 2014, after they finished the 2013 season with a disappointing 4–8 record. The Horned Frogs started with a 4–0 record to begin the year, with wins over Samford, SMU, #24-ranked Minnesota which would finish the season unranked, and rallying in the 4th quarter to beat #4-ranked Oklahoma, which would also finish the season unranked. After the upset of Oklahoma, the Horned Frogs rose to the #9 ranking going into their October 11 meeting with then #7-ranked Baylor. With approximately 11 minutes remaining in the game and despite Baylor leading in every offensive statistical category, TCU had a commanding 58–37 lead over the Bears. Baylor then dominated TCU by scoring 24 unanswered points in the fourth quarter to defeat the Horned Frogs 61–58. Baylor would finish the game with 782 yards of offense and 39 first downs compared to TCU's 485 yards of offense and 23 first downs. The Baylor game would be the lone loss for TCU in 2014, and despite having to rally against Big 12 bottom-dweller Kansas, they would win their remaining seven games behind the leadership of their Heisman Trophy finalist quarterback, Trevone Boykin. The Horned Frogs began to emerge as a National Championship contender after their convincing 41–20 win over then #7-ranked Kansas State. Despite their struggles against last-place Kansas and Oklahoma and their loss to Baylor, going into the final week of the regular season, TCU was ranked #3 in the newly formed College Football Playoff poll, which coincided with the new College Football Playoff system, whose format selects the Top 4 teams in the rankings at the end of the season to participate in a four-team playoff system to decide a National Champion. TCU soundly defeated Iowa State in their final regular season game to finish the 2014 season with an 11–1 record. Due to the Big 12 recognizing co-champions in football through 2014, the Horned Frogs also claimed a share of the Big 12 Conference Championship along with Baylor, despite their earlier head-to-head loss to Baylor. The Big 12 has since changed the tiebreaker rule, giving the head-to-head winner of tied teams the conference championship trophy, starting in 2015. On December 7, 2014, the final College Football Playoff rankings were released, and the Horned Frogs dropped to the #6 ranking in the poll, abruptly ending the Horned Frogs' National Championship hopes. TCU decimated #9 Ole Miss 42–3 in the Peach Bowl. The Horned Frogs have played their home football games at Amon G. Carter Stadium, located on the campus of TCU, since 1930. Named for the famous Fort Worth newspaper magnate who made the original donation to finance the stadium, Amon G. Carter Stadium opened in 1930 with an original seating capacity of 22,000. The first game played in the stadium was in October, a 70–6 TCU victory over the Arkansas Razorbacks. Renovations in 1947 and 1955 added additional seating and an upper deck, which increased capacity to roughly 45,000. The stadium remained in this configuration until 2010, when a major renovation reduced the entire stadium to its original lower bowl, before erecting a new stadium on the same site. The design of the current Amon Carter stadium was influenced heavily by the surrounding architecture of Fort Worth, with emphasis on Art Deco style. The Frogs opened the new stadium in time for the 2012 season. Amon G. Carter stadium features a natural grass field and a seating capacity of roughly 45,000. Standing-room only concourses allow capacity to exceed this number when ticket demand exceeds seating availability. The record attendance is 50,307 which took place on November 14, 2009 when the Frogs played the then No. 16 ranked Utah Utes. The final score was a whopping 55–28 in favor of the Frogs. The 2012-2012 renovation added a 54 ft. video board over the North endzone, with a smaller videoboard located in the Southeast corner. Before Amon G. Carter Stadium, the Horned Frogs played their home games on campus at Clark Field, located at the current site of Mary Couts Burnett Library. TCU's school colors are purple and white. Historically, black has also featured prominently in the school's uniforms. As early as 1935 the football team wore black leather helmets with a purple stripe, or occasionally purple helmets with a black stripe. Jerseys were purple with white numbers were, worn with beige or khaki pants. Beginning with the introduction of plastic helmets in the 1946 TCU dropped black from their uniforms and introduced a new purple helmet with a white stripe. The team's pants remained khaki colored until the 1950s, when they were changed to white. During this period the exact shade of TCU purple varied wildly depending on the uniforms worn, though a royal purple was most common. In 1971 the school hired Jim Pittman as its head coach. Pittman had been an assistant at the University of Texas when the Longhorns had changed their color from orange to burnt orange, and wanted to do something similar at TCU. Pittman chose to introduce a very pale shade of lilac into the TCU uniforms, and the team quickly became known as the "Lavender Hill Mob." These uniforms are often regarded as the worst in TCU's history. TCU returned to a royal purple in 1974 following Pittman's premature and tragic death on the sidelines. Beginning in 1998, TCU began once again incorporating black into the uniforms. The practice was started by Coach Franchione, who introduced a new helmet with black facemask, and purple jerseys with black pants. In 2012 the school debuted helmets which featured a black stripe in addition to the black facemask, reflecting the helmets worn during the TCU championship years of the 1930s. TCU was the last school in college football to wear leather helmets, switching to hard plastic helmets in 1946. Prior to 1946 the TCU football team wore either black helmets with a purple stripe, or purple helmets with a black stripe. Since the introduction of plastic TCU helmet has gone through a number of designs. In the 1950s TCU wore a purple helmet with white stripe down the middle. In 1954 a gray facemask was introduced, and in 1958 white numbers were added to the sides of the helmet. In 1965 a new helmet was introduced featuring a purple shell and a white stylized Horned Frog on the side. A different, fiercer Horned Frog design was used for the 1966 helmets, featuring just the Frog's head. In 1967 the school used a pattern similar to that of Texas A&M. In 1977 the school introduced a "Flying TCU" logo, which remained on the helmets until 1991, and remains popular with the school and especially students today. In 1992 Head Coach Pat Sullivan introduced an arched TCU design, which eventually became the official logo of the school. This logo has been featured on every TCU helmet, with slight variations, ever since. TCU holds two national championships in football, one from 1935 and the other from 1938. In 1935, TCU spent most of the season ranked No. 1 in the country before losing a regular season game to then No. 2 ranked SMU in the "Game of the Century." SMU went on to lose to Stanford in the Rose Bowl, while TCU went on to beat LSU in the Sugar Bowl. Since the Associated Press and wire services didn't award national championships until 1936, TCU recognizes a statistical poll created by Paul O. Williamson who awarded his national title to LSU and TCU for the 1935 season. The 1938 team was undefeated and was the consensus #1 team in the Associated Press Poll. Note that the 1920 TIAA Championship was disputed between TCU and Austin College. Although TCU defeated the Kangaroos 9–7 on October 9, 1920, one of the TCU players, Allen Rowson, was declared ineligible after the 1920 season due to transfer rules. In 2014, TCU became just the fourth program in history to have competed in all six of the modern day CFP bowls (Rose, Fiesta, Sugar, Cotton, Peach and Orange). TCU joined Florida State University, Miami(FL) and the University of Tennessee to earn this distinction. TCU has a combined 6–5–1 record in those bowls, notching wins in all but the Fiesta and Orange. Note: Unless otherwise indicated, all hometowns are in Texas. Gary Patterson, current head coach of the TCU Horned Frogs. Because TCU was a member of the Southwest Conference for 72 years, rivalries remain with many of the schools that once participated in that conference. Most of former Southwest Conference members are located within the state of Texas. This rivalry is prominent for both schools, as both are located in the Dallas-Fort Worth Metroplex and were long-time members of the SWC before its dissolution. TCU leads the football series with SMU, 48–40–7. The SMU – TCU football game is called "The Battle for the Iron Skillet", with the winning team gaining possession of a ceremonial iron skillet. Since 1915, when SMU was founded and began football competition, the game has not been played in only three years when both fielded football teams — 1919, 1920 and 2006. The schools are scheduled to compete through at least 2016. Because they are no longer members of the same conference, annual meetings may or may not be scheduled after 2016. The TCU-Baylor rivalry is one of the most-played rivalry games in college football. The series, which dates back to 1899, is also one of the most evenly-matched rivalries in the country and is currently split evenly with a 52–52–7 record. At its inception, the TCU–Baylor game, unofficially referred to as "The Revivalry" by some fans, was a battle of two cross-town rivals in Waco, Texas. When the main administration building at TCU, then known as AddRan Christian University, was destroyed by fire in the early 1900s, TCU relocated to Fort Worth, Texas, but the rivalry between two of the state's premier private universities continued. Appropriately, given the more than century-long history of this highly-competitive rivalry, the first game between TCU and Baylor, played October 27, 1899, ended in a 0–0 tie. Each school achieved various period of dominance between 1899 and the breakup of the Southwest Conference at the conclusion of the 1995 season, but at the time the Southwest Conference disbanded, the Bears held only a slight 49–47–7 advantage. After a 10-year, post-Southwest Conference breakup hiatus, the series was renewed for 4 non-conference games in 2006, 2007, 2010 and 2011. TCU, then a member of the Mountain West Conference, notched a 3–1 non-conference record over Baylor in these games. The 2010 game, won by the Horned Frogs, featured a TCU team that would go on to complete a perfect 13–0 season and win the 2011 Rose Bowl Game. That 2010 TCU football season, to many, represented the reemergence of TCU football as a national power and carried great weight in earning the Horned Frogs an invitation to join the Big 12 Conference. The 2011 game, won by Baylor, featured Baylor's first Heisman Trophy winner, quarterback Robert Griffin, III. That 2011 Baylor football season, to many, represented the emergence of Baylor football to national relevance. After these consequential non-conference games, the series was tied at 50–50–7 when TCU joined Baylor as a member of the Big 12 Conference in 2012. The football series dates back to 1926, 25–30–3. TCU was the first Southwest Conference team to play Texas Tech. The Texas Tech University Goin' Band from Raiderland was the first college marching band to travel to an away game when Will Rogers financed their trip to accompany the Red Raiders to Fort Worth. After the collapse of the Southwest Conference, Texas Tech was the first of the schools that joined the Big 12 Conference in 1996 to schedule a non-conference game with TCU. This first post-Southwest Conference game between TCU and its former conference mate was played in the regular season in 2004. Prior to Texas Tech joining the SWC, a traveling trophy was exchanged between the Horned Frogs and Red Raiders. The trophy was of a miniature saddle and the game between the teams was dubbed "The West Texas Championship." TCU and Texas Tech return to being conference mates, competing in football annually, in 2012. In 2014, 109 points combined was put up, in a 82–27 rout by TCU. Former SWC rivals include Houston, Rice, Arkansas, and Texas A&M. While in the C-USA, TCU engaged in new rivalries with Louisville and Southern Miss. In 2005, after joining (and winning) the Mountain West, TCU immediately started new rivalries with Utah and BYU, as they were the conference's top two programs. Because the Mountain West wasn't an automatic qualifier in the BCS, these 3 teams were always battling for an At-Large spot in one of the 4 BCS Bowls. Boise State was also in contention for one of the At-Large BCS spots, which led to a rivalry between TCU and Boise St. In 2011, after splitting bowl games in the 2008 and 2009 seasons (and Utah and BYU defecting to the Pac-12 and Independence/WCC, respectively), Boise State moved over from the WAC to join TCU in the Mountain West. Because Boise State replaced Utah in the conference schedule, the TCU-BSU game was supposed to be played in Ft. Worth, but as TCU was leaving for the Big East in 2012, the conference voted to have the game take place in Boise; this led to even more tension between the two schools. In fall 2010, after announcing intentions of moving to the Big East in 2012, fans of TCU and West Virginia, the class of the Big East, began debating which team would win the conference during their first season together, the "unproven" BCS Buster (TCU) or the established Big East power (WVU). In fall 2011, after Texas A&M and Missouri announced their intentions of moving to the SEC for 2012, TCU and West Virginia accepted invitations to join the Big 12 in that year. This only furthered the TCU-WVU debate, which has led to a small new rivalry. Also, with TCU replacing Texas A&M in the Big 12, their former rivalry sparked back up within the state through recruiting, press, and the fans, although not on the field. As of November 30, 2015, there are 13 former TCU Football players on NFL active rosters. ↑ "TCU Branding: Visual Identity Standards" (PDF). Texas Christian University. 2014-10-01. Retrieved 2013-04-01. ↑ Jenkins, Dan; Fitzgerald, Francis J., eds. (1996). Greatest Moments in TCU Football. AdCraft Sports Marketing. p. 27. ISBN 1-887761-04-7. 1 2 "2006 TCU Football Media Guide" (PDF). 2006. p. 154. Retrieved 2007-05-25. ↑ "D1aFootball.com 1923 SWC Standings". Archived from the original on 2007-09-27. Retrieved 2007-05-25. ↑ "D1aFootball.com 1924 SWC Standings". Archived from the original on 2007-09-27. Retrieved 2007-05-25. ↑ "D1aFootball.com 1928 SWC Standings". Archived from the original on 2007-09-27. Retrieved 2007-05-25. ↑ Jenkins, Dan; Fitzgerald, Francis J., eds. (1996). Greatest Moments in TCU Football. AdCraft Sports Marketing. p. 33. ISBN 1-887761-04-7. 1 2 Jenkins, Dan; Fitzgerald, Francis J., eds. (1996). Greatest Moments in TCU football. AdCraft Sports Marketing. p. 55. ISBN 1-887761-04-7. ↑ Jenkins, Dan; Fitzgerald, Francis J., eds. (1996). Greatest Moments in TCU Football. AdCraft Sports Marketing. p. 14. ISBN 1-887761-04-7. ↑ "NCAA D-IA Football Past Champions". Retrieved 2007-05-25. ↑ Jenkins, Dan; Fitzgerald, Francis J., eds. (1996). Greatest Moments in TCU Football. AdCraft Sports Marketing. p. 73. ISBN 1-887761-04-7. 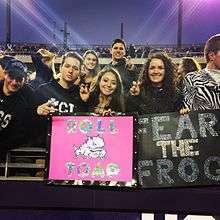 ↑ "TCU – News and Events". ↑ Jenkins, Dan; Fitzgerald, Francis J., eds. (1996). Greatest Moments in TCU Football. AdCraft Sports Marketing. p. 138. ISBN 1-887761-04-7. ↑ "Syracuse University Athletics - 1957 Cotton Bowl". cuse.com. Retrieved 2016-10-02. 1 2 3 "Major Infractions Database: Texas Christian University" (Press release). NCAA. May 9, 1986. Retrieved 2007-07-08. ↑ "Amon G Carter Stadium Redevelopment". Texas Christian University. Retrieved 2011-03-18. ↑ Final (2014-10-11). "TCU vs. Baylor – Box Score – October 11, 2014 – ESPN". Espn.go.com. Retrieved 2016-01-17. ↑ "Tiebreaker Procedures – Big 12 Conference – Official Athletic Site". Big12sports.com. Retrieved 2016-01-17. ↑ "TCU lets it all out in rout of Ole Miss". Fort Worth Star-Telegram. Retrieved 2014-12-31. ↑ "Goin' Band from Raiderland: History". Orgs.ttu.edu. 1997-12-03. Retrieved 2016-01-17. ↑ "Pettit: TCU's return re-stirs memories of days left behind | Lubbock Online | Lubbock Avalanche-Journal". Lubbock Online. 2011-10-15. Retrieved 2016-01-17. ↑ "TCU Football Future Schedule". Retrieved 2008-12-10. ↑ "TCU Horned Frogs Football Schedules and Future Schedules". fbschedules.com. Retrieved 2012-02-25. ↑ "NFL Players by College – T – National Football League – ESPN". Espn.go.com. Retrieved 2016-01-17. ↑ P.J. Dawson. "Cincinnati Bengals: P.J. Dawson". Bengals.com. Retrieved 2016-01-17.